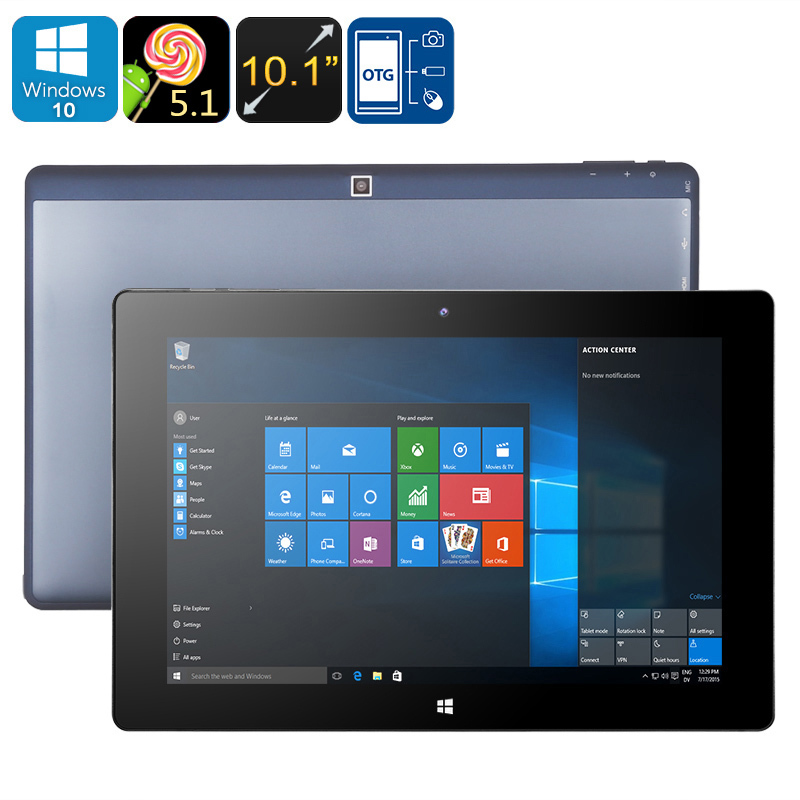 Successfully Added Android + Windows 10 Tablet PC - 10.1 Inch Display, Quad Core CPU, 2GB RAM, Wi-Fi, Bluetooth, Micro SD Card Slot to your Shopping Cart. This 10.1-inch tablet PC is an excellent value portable computer that can double as a cheap laptop thanks to the availability of a magnetic dock keyboard. This optional extra will really boost the functionality, so whether you want to surf the web, play games or get down to business, this tablet PC has you covered. Running on an Intel Z8350 Quad Core CPU, that hits speeds of 1.84GHz, and with 2GB of RAM, this 10-inch tablet PC is more than capable of meeting all your daily requirements. The Windows 10 and Android dual-operating system is perfectly balanced to deliver proficient touch screen computing as well as all the requirements of a laptop and conventional desktop computer use. The full array of MS Office applications are available from the app store and with Intel Gen8 graphics you'll find this table offer plenty of movie and gaming potential as well. A large 10.1-inch display is as good as it gets when you want portability without sacrificing work space. With HD graphics and great brightness, you'll enjoy a vivid vibrant display that will bring movies and games to life. 32GB of onboard memory is complemented by a micro SD card slot letting you add an additional 128GB of storage. Thansk to the OTG function you can boost this further using a memory pen so it's easy to take a large library of media, games, and music wherever you go. When it comes to connectivity you will have wireless network support and for connectivity on the go, this windows tablet supports 3G USB dongles. You can even enjoy all the tablet has to offer on a large scrrewn via the mini HDMI port. With a 2MP rear camera, you can snap and share photos and videos directly online. The front facing camera serves well for video calls and will let you snap some memorable selfies or even take HD videos. Thanks to a 6800mAh battery you'll enjoy hours of fun entertainment and can get plenty of work done when away from the office. This Windows 10 Tablet PC comes with 12 months warranty, brought to you by the leader in electronic devices as well as wholesale Tablet computers and accessories.. The OS version on this device cannot be upgraded or flashed and any attempts to modify the default OS will void the warranty. As a wholesaler, we provide no software support, advice, or training regarding the Windows operating system and software.